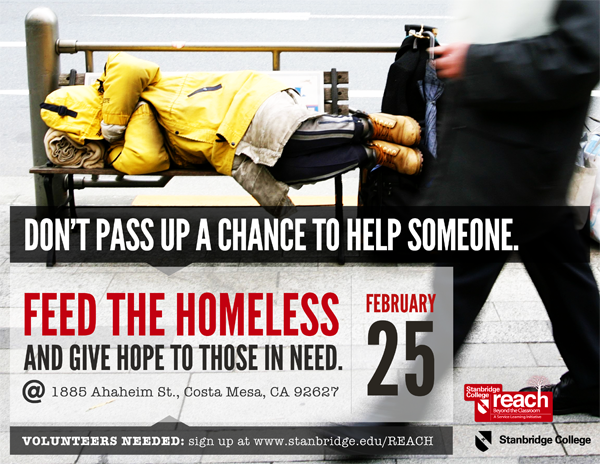 Stanbridge College REACH is looking for compassionate volunteers to help provide the homeless of Orange County with change that they could really use. Join us to prepare and serve a warm meal to over 400 homeless and low-income families on Saturday February 25, 2012. Volunteers will be able to prepare food, set up the dining hall, serve meals and give a little bit of hope and care to those in need. – sodas – these are such a treat for these men, women and children and they go so fast! Homelessness can happen to anyone. Let’s work together to help our fellow community members and give them the support they really need.